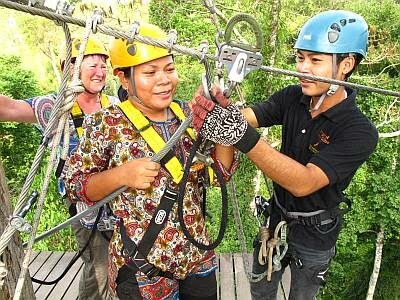 The latest admission / entry ticket price for Flight of the Gibbon Pattaya zip-line tour, as advertised on their own website is 3,999 baht per person. This includes transfer to and from your hotel, lunch and all activities. Read this Pattaya online tour and entry ticket booking guide and find the cheapest entry tickets to Flight of The Gibbon and all the top attractions, activities and tours in Pattaya. Looking for more things worth doing in Pattaya? check out this list of best rated things to see and do in Pattaya. 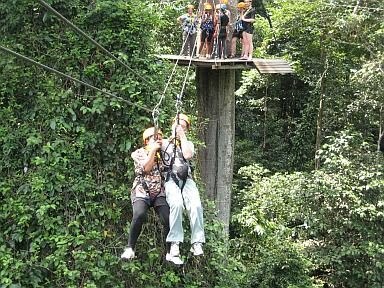 The Flight Of The Gibbon is quite a new tourist attraction to the Pattaya area but it has quickly become established along with it’s sister venture in Chiang Mai as one of the leading Thailand tourist attractions. 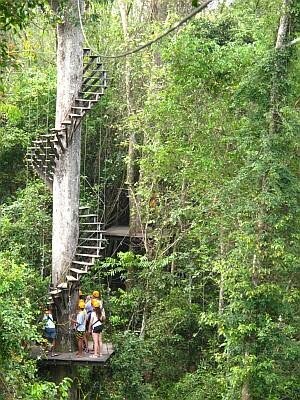 Based on a concept devised by Eco scientists many years ago in Costa Rica so they could more closely study the Eco system of the rain forest canopies using a system of zip lines, platforms and pulleys, the Flight Of The Gibbon has made this once exclusive domain a thrilling adventure for everyone. 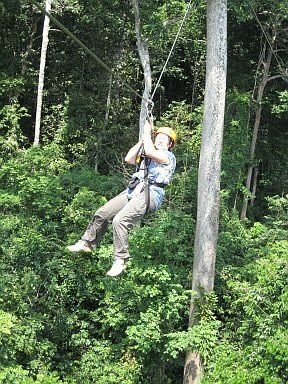 On arrival at the starting point of Flight of The Gibbon you are formed in to groups and dressed with a harness to which a safety line and trolley mechanism are attached plus a safety helmet. Your 2 guides will give you a demonstration on the use of your equipment and techniques. 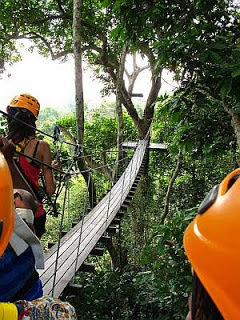 And now the fun begins, over 50 meters high in the rain forest canopy perched on wooden platforms, some of which offer a spectacular view over the canopy roof. Your guide attaches your trolley to the wire rope and away you go, traversing to the next platform where the second guide is waiting to catch you and pull you in. 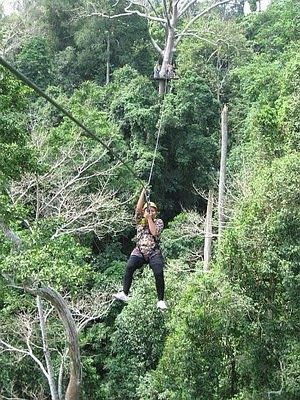 There is over 3 kilometers of zip lines through the tree canopies, the longest of which is 300 meters long. Just when you thought you could handle anything you arrive here, you can’t see the platform at the other end due to the wire dipping under the canopy, time to brace yourself. again. Once you have overcome your fear and the adrenaline is pumping through your veins you will have the time of your life here. Have a look at the photos and video below to fully appreciate a day out which words just can’t describe, this is definitely not your run of the mill Pattaya tourist attraction. She flies through the air with the greatest of ease. 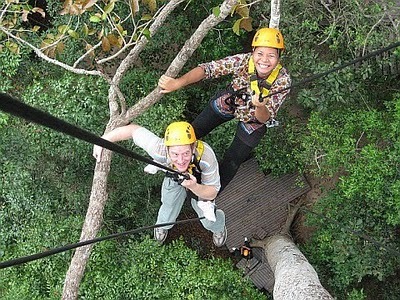 As well as breath taking adventure the Flight Of The Gibbon offers some of the most breath taking scenery you will see within easy reach of Pattaya. The guides on the Flight Of The Gibbon take care of everything to ensure your safety at all times. There are also 2 vertical descents, as you can see it’s a long way down. A zip line ride for 2. There’s no age limits at Flight Of The Gibbon, here’s Grandma to prove it. The stairway to heaven !!. You think you are high enough already, and then you go higher. Bridges add a little variety to the day. We thought we saw a Gibbon.